Planning a Retro Modern Wedding? Home » Lifestyle » Planning a Retro Modern Wedding? This little SoCal pinup knows so many people that got engaged last year. It’s making my head spin. Did you get engaged over the holidays? Congratulations!! 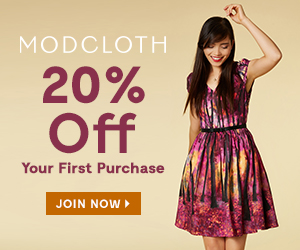 ModCloth has a fun line of bridal dresses and accessories for you to plan your vintage-inspired wedding? Just take a look at all the options they have for bridesmaid dresses, your girlfriends will be thrilled to have a dress that they can wear after the wedding too! 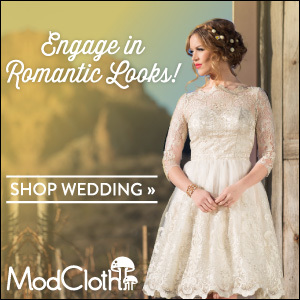 And in true ModCloth fashion, they also have a full line of plus size wedding styles so everyone in your bridal party will look Mod-tastic! I went cocktail …all sequins! Love that dress, what a cute idea. I adore that dress gorgeous! I would love that dress as an engagement dress. Mmmm vintage weddings are the best! I think it’s such a cute dress! This looks like a pretty and comfortable dress. I’d love to see it in person.